For other uses, see Street Smart. Street Smarts was a United States game show that featured two in-studio contestants trying to predict the outcome of interviews of people who were found on the street. The show, which was presented by Frank Nicotero, aired in syndication from 2000 to 2005. Before the game actually starts, two studio contestants are introduced, as well as three "street savants", whose interviews were pre-recorded. A question is posed, and the studio contestants must choose which of the three "savants" gave the correct answer. A correct guess earns $100. Three questions are asked in this round, and sometimes two "savants" will have answered a question correctly. Sometimes, as an aside, Nicotero will call for a wrong-answer clip to be played to add humor to the show. This is similar to the first round, but the object is to guess who got the question wrong; for each question, only two of the "savants" are considered (one of whom answered correctly), and correct guesses are now worth $200. Also, a Dunce Cap is in play in Round Two; Once the question is posed, an in-studio contestant can hit their buzzer if he/she thinks that his/her opponent does not know the answer. The person hitting his/her buzzer usually placed the Dunce Cap on his/her opponent. The "dunce" is allowed to hear the question in its entirety, and must then answer the question within 5 seconds. If the dunce gets the question wrong, $200 goes to the person who hit the buzzer. However, if the dunce does know the answer, then the "dunce" gets the $200 and is allowed to place the dunce cap on his/her opponent (that is, the person who hit the buzzer originally). In either case, the cap must be worn for the remainder of the round. Also, only one dunce cap opportunity is available. The third round saw the two contestants choose one of the "savants" to work with for the entire round. The round was known as "Pick Your Pony" for the first three seasons and "Pick Your Brain" in the final two seasons. Each question goes to an individual contestant, who must decide whether their "brain/pony" got the question right or wrong. Three questions are asked of each contestant, for a total of six in the round. Correct guesses are now worth $300. The Dunce Cap is back in this round, regardless of whether it was used in the previous round. Once again there is one dunce per round, but dunces are now worth $300. The "right" reference is indicated in green; the "wrong" reference in red. Before the final commercial break, a question is asked. During the commercial, the contestants each choose, in secret, 1) which "savant" they wish to pick, 2) whether they got the question right or wrong, and 3) the amount of their score that they wish to wager. A correct guess adds the contestant's wager to his/her score, while an incorrect guess loses the wager. High scorer at the end of the game keeps their money, and, in season 5, has the opportunity to risk their winnings for the possibility of a slot in the season-ending Tournament of Champions (see below). An exception to this rule occurs when celebrities play for charity: the winning player's charity receives the money won, with a minimum of $1,000; the losing player's charity receives $500, regardless of the actual score. The theoretical maximum win on Street Smarts was $4,600, this required getting all questions right, an all-in bet on the "Wager of Death," and winning both "Dunces." If the game ended in a tie at more than $0, one final question was asked to both studio contestants. The first player to buzz-in chooses to either answer the question or pass it to his/her opponent. If the buzzing player chooses to answer, he or she must answer based on the information given to that point; if he or she passes, the other player is allowed to hear the entire question. A correct answer by the responding contestant wins the game; answering incorrectly awards the game to their opponent. The tiebreaker only takes place if the players have money; if both players have $0, then the game is over and nobody wins. In all celebrity episodes, the game ends in a tie and both charities receive the same amount. For the first season of Street Smarts, the contestants sat in chairs and recorded their answers in the first two rounds using a mechanical trilon and a paddle for the "Pick Your Pony" round. For the Wager of Death, the contestants would write their wagers and predictions down. Meanwhile, television screens positioned next to their chairs would show the score. Beginning in season two and continuing for the remainder of the series, the contestants stood behind a desk for the whole show and recorded their answers by way of pushing buttons. Most of the questions asked of the savants are designed to be things people should know, but apparently do not (similar to the segment Jaywalking on The Tonight Show with Jay Leno). For example, in one episode, a savant was asked "What color is the exterior of the White House?" After some thought, the savant answered "Beige." Another notable example was an elderly woman who claimed to be a nurse and, when asked what HMO meant, she got it confused with the premium television channel, HBO. Occasionally Nicotero, when asking the savant, would break the fourth wall, such as when a savant who was in the US Navy was asked to define "league" as in 20,000 Leagues Under the Sea. After getting it incorrect, Nicotero walked up to the camera and said to the contestant "I bet you thought she would get this right!" Sometimes the questions would be vocabulary-based, in which a word, such as pinochle, was shown to the contestant, who would then have to speculate whether or not the savant used the word properly in a sentence. Other questions are trick questions that are designed to catch some people off guard. These are also to see if the savants are paying attention. For example, Nicotero asked one savant, "Canada is the capital of what state?" (Mark DeCarlo was able to successfully put the dunce cap on Mark L. Walberg on that same question and earn $200 for it.) The savant replied, "Australia!" Later, another savant pointed out the right answer by saying, "It's not! It's a country!" Sometimes shows took on a certain theme, with Nicotero interviewing the savants in a costume akin to the theme. A couple episodes had been known as "Revenge Episodes", in which savants who believed they had been humiliated on air could get the chance to make money as contestants themselves. Some of the people who were invited back for "Revenge Episodes" were not humiliated, but simply very entertaining. One of these persons was Russell Fletcher who showed up as a savant and then was invited back as a contestant. Fletcher was mostly invited back to the show due to the enormous amount of e-mail and snail mail that was directed at him because of his showing of real knowledge in most areas of questions. In November 2000, one episode revolved around the United States 2000 presidential election where Nicotero wore an Uncle Sam costume when questioning savants and all questions pertained to American elections or political workings, such as "Why did Bill Clinton refuse to seek a third term?" Other shows invited classic television stars and game show hosts to play for their favorite charities. The episode that pitted Mark L. Walberg (who at the time was hosting the game show Russian Roulette) against Mark DeCarlo (who at the time was voicing Hugh Neutron (the title character's dad) on Jimmy Neutron: Boy Genius) was notable in that Walberg won the game with $2 to DeCarlo's $1. But because it was a charity episode, Walberg received $1,000 for Goodwill Industries of Southern California while DeCarlo received $500 for the M.S. Society of America. To celebrate the series being the first street-interview show in 20 years to be renewed for a fifth season, Street Smarts offered its winning contestants an opportunity to compete for $100,000 in a season-ending, single-elimination tournament for what proved to be its final season. On each episode the winning contestant was given the choice to either take whatever money he/she had won and leave, or forfeit the money and receive a spot in the tournament instead. Thirty-two contestants elected to give back their winnings to take the chance at winning $100,000. The tournament took place over the final thirty-one episodes of the season, and each game was played for points instead of money. The first sixteen episodes comprised the first round, referred to as "The Thunderous 32" on air. The winners of those episodes advanced to the second round, consisting of eight episodes and called "The Savvy 16". The eight winners from those episodes advanced to the third round, consisting of four episodes and called "The Great 8". The winners would face off in the last two episodes before the final, called "The 'Phat' 4", and the winners of those two games faced off in the final match, referred to as "The Six-Figure Showdown", for the $100,000 grand prize. The tournament concluded on May 25, 2005, with Teresa Lee winning the final match and the $100,000. 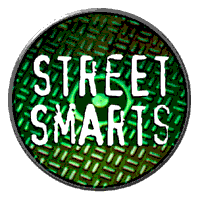 The tournament final also served as the final episode of Street Smarts (as the series was not renewed for the 2005-06 season), and reruns continued until September 23, 2005. Reruns of the show have aired in the past on both WGN America and Game Show Network. Originally, the show was to have three "field reporters" who would appear on location with the savants and ask them the questions with the main host only appearing in the studio. The idea was later scrapped mostly due to lack of talent from those who auditioned, and Nicotero, who originally signed on as a field reporter, was promoted to main host as well as asking questions to all savants. This page was last edited on 17 February 2019, at 06:48 (UTC).